In the tradition of the original "Buffalo" style hot wings from the historic Anchor Bar in Buffalo, New York, the Rocky Mountain Wingshak brings the amazing hot wing tradition to the west! Located in American Fork, Utah, the Wingshak provides an authentic Hot Wing experience that includes the traditional "naked" Hot Wings, Boneless Chicken Strips, chicken sandwiches, chicken salads, and New Buffalo Chicken Wraps all tossed in one of 15 amazing Wingshak sauces and much, much more! Then choose any of our 15 sauces for your wrap and garnish with your choice of Wingshak's Ranch or Bleu Cheese. We want you to call in so we can answer any questions you may have, also, although we try our very best not to, we sometimes have to increase our prices due to market changes. Do you have any take out menus? No, we do not. We typically will refer you to our website wingshak.com for all menu, hours and information. Can we have multiple sauces with our wings? Anything under 20 wings cannot be split into different sauces, however, you may order the wings plain and receive one sauce for free. Additional signature sauces can then be purchased at menu pricing. Why do you charge extra for additional sauces and dressings? Wingshak has recipes for all sauces and dressings. These sauces and dressings cannot be purchased anywhere else. As a small business and as an industry standard, we charge a minimal price for all additional amounts of our signature sauces and dressings. These signature sauces and dressings can be purchased in larger containers so you can have them at any of your own parties, family gatherings, etc. Inquire at the store for purchase details. Can we order large amounts of wings for parties, events, etc..? Yes, however, there are specific hours during the day that will make larger orders problematic. Preferably, if you need large quantities of wings between the hours of 11am to 2pm, please call us at least one day in advance to make arrangements. This will allow us to accommodate the large number of customers that come to the Wingshak during these hours each day. What if we want a large number of individual takeout orders during the hours of 11am to 2pm? To handle the large number of customers during this busy time, we ask that you keep takeout orders to a maximum of 5 orders per call. This will allow us to give our full attention to as many of our customers as we can. In the future, we would like to incorporate a takeout system which will give us the ability to handle all takeout orders. We appreciate your patience as we continue to grow as a small business and strive to accommodate all of the customer interest that we receive at Wingshak. How long does a typical order take to get ready? This is something that the Wingshak prides itself on. Typically, our lead time for orders under 50 wings is 15 minutes (that's right, 15 minutes! Compare that to our competitors!). At our peak busy times, we can run up 25-30 min which still beats our competition hands down. In the past we could not, but in 2015 we added an addition which gives the Wingshak a total of 122 seats. These additional seats have allowed us to accommodate the growing amount of customers as well as any large groups or parties you wish to entertain. Calling ahead for large groups is preferred. This will allow us to accommodate your group in the best possible way. Can we buy gift cards for the Wingshak? Yes. We sell gift cards in $10 dollar increments with no limit. Twice a year we have a special deal that gets you extra gift cards for free with the purchase of a minimum amount determined by the Wingshak. You can be made aware of when this happens by liking the Rocky Mountain Wingshak Facebook page or following us on Instagram (@rockymountainwingshak). Wingshak prides itself on being the best, so compare our gift card deal to any competitor and you will see that we beat them hands down. Can we order unsauced wings for parties, get togethers, sporting events, etc..? Not many know this, but Wingshak instituted a program called take and bake many years ago. It consists of purchasing at least a 20 wing minimum with no maximum limit. The wings are then cooked and placed into an oven ready tin. Sauces are given, 4 ounces for each 10 wings. For each additional 10 wings purchased, you may select a different sauce. You will also receive dressings and baking instructions. Wings, sauces and dressings can then be taken home and stored in the refrigerator until you need them for your party. We have have had customers get this take and bake option as early as three days in advance and they came out great! Admittedly, Wingshak would be the first to say that fresh cooked is better. However, this take and bake option is better than anything else you can get for your Sundays or holidays when the Wingshak is closed. On a Friday evening in 1964, Dominic Bellissimo was tending bar at the now famous Anchor Bar Restaurant in Buffalo, New York. Later that night, a group of his friends arrived at the bar with ravenous appetites. He asked his mother, Teressa, to prepare something for his friends to eat. Teressa deep fried chicken wings and flavored them with a secret sauce. The wings were an instant hit and it didn't take long for people to flock to the bar to experience this new taste sensation. The phenomenon created in 1964 by Teressa Bellissimo has since spread far and wide across the globe. 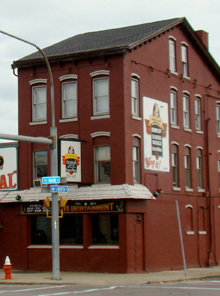 Jim and Melissa Strader expanded on the Buffalo Wing phenomenon with their own unique and delicious sauces. In 1999 they opened the original Wingshak in Farmville, Virginia. When Jim and Melissa moved west, they brought their winning and mouth-watering recipe creations to Utah and established the Rocky Mountain Wingshak. 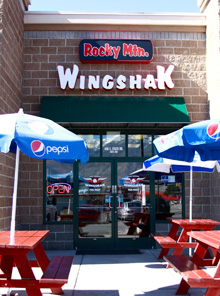 The Whited family purchased the Rocky Mountain Wingshak in 2008 and successfully continues the traditions of fantastic, original Buffalo Wings and great service with there location in American Fork, Utah.